So you feel safe and protected when shopping with us, we have summarized our Terms and Conditions here to make things easier for you. Delivery times vary depending on the device and network operator, but we always try to speed up every request. It is our top priority to do so, but sometimes these processes are delayed for reasons beyond doctorSIM's control. At present, the range of delivery times is from a few minutes to several business days. If you have any questions, we recommend you get in touch with us before the making your request. Requests are made and paid for at www.doctorSIM.com. Subsequently, doctorSIM will e-mail an unlock code with clear instructions to the customer. doctorSIM acts as an intermediary between a number specialized unlocking service providers and the customer. Our goal is to offer a safe, professional unlocking service with an exceptional customer support for consumers worldwide. Make sure that the phone prompts for the unlock code. Customers can check out the specifics of the model in the doctorSIM website, or contact our support centre before making the request. Be aware of all the necessary passwords or keys that the phone requires, such as PIN, PUK, unlock pattern, or Vodafone Protect key. Unlocking will not be possible if the customer doesn't know the access passwords. Refunds will not be issued as it is the user's responsibility to know this information. 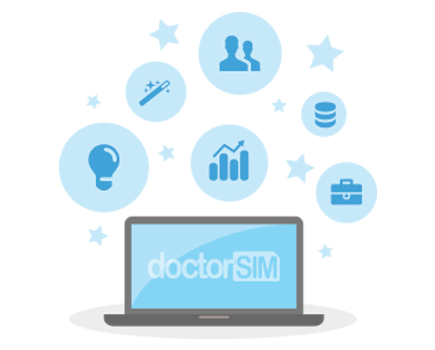 doctorSIM commits to help and solve any doubt or issue, once the customer recovers the lost password. If you cannot perform these checks, contact us at info@doctorsim.com before making your request. doctorSIM reserves the right to refuse processing requests at any time if there is any suspicion of illegal or fraudulent activities involved. doctorSIM will not be held responsible for delays caused by external suppliers, but will make every effort to deliver the unlock code with the utmost diligence, in the shortest time possible. Business hours: Weekdays from 10:00 to 22:00 (CET+1, CET+2 during the summer). Prices will be displayed in your local currency by default, however payments will be processed in euros. Please be aware there might be slight differences in website prices and bank charges due to currency conversion differences. Prices include all applicable taxes. Unlock code prices may vary from one day to another. However, doctorSIM will guarantee the price displayed on the web at the time of checkout. Unlocking requests are processed automatically. Once the payment is processed you may cancel your request during the following 10 minutes. To cancel your request during those first 10 minutes, answer the confirmation e-mail or e-mail us at info@doctorsim.com using the same e-mail account you used to make the request. After 10 minutes, the system will process your request automatically making cancellations and refunds no longer possible. If the unlock code for your phone is not available and none of the cases detailed in section ii (subsections a, b, c and d) apply, doctorSIM will refund your money. These phones will remain inoperable despite any attempt to unlock them. If you have found or bought a phone from a stranger, make sure it has not been blacklisted/reported or blocked before requesting an unlock code. doctorSIM will not issue refunds for such phones. Some phones have limited unlocking attempts. Once these have been exhausted unlocking the phone via IMEI will not be possible unless the counter is reset. This reset is not always possible for some phones. We recommend our customers contact doctorSIM before exhausting unlocking attempts to find alternative solutions. doctorSIM will not issue refunds if the phone has exhausted its unlocking attempts but will try to solve the problem for the customer. doctorSIM cannot check whether a phone is free or has been previously unlocked. We recommend performing this check before making a request since doctorSIM will not refund requests on free or previously unlocked phones. Any sort of modification to the original software and hardware settings of the phone that might interfere with the functioning of the unlock code and instructions supplied by doctorSIM. doctorSIM will issue refunds either to the credit card, bank or PayPal account used in the purchase, or as doctorSIM credits. Depending on the user's bank conditions, refunds may take 48 to 72 business hours to be credited. Refunds in credit will grant the user credits that can be used in future purchases at doctorSIM, therefore avoiding transfer and banking fees. Credits granted as a refund do not have an expiration date. Bank transfer refunds may only be made to accounts held at institutions from Spain or Mexico. doctorSIM will not issue international transfers, since this payment method is only available in these two countries. If the customer wishes, and accepts the transfer fees, an account from a different country may be selected; however, doctorSIM will only be able to transfer the funds to an account in Spain or Mexico. doctorSIM recommends selecting a different payment method for international transactions: credit card, PayPal, DineroMail etc. doctorSIM offers customers a loyalty program in the form of doctorSIM credits. Customers will be able to receive credits upon signing up, making a request, recommending services, and taking place in contests and promotions held by doctorSIM. Credits are to be redeemed upon purchasing services from doctorSIM. Each credit is equivalent to 1 euro, or the corresponding exchange rate for other currencies. Credits may only be used to purchase services offered by doctorSIM. Purchases of doctorSIM services that are paid for partially or totally with credits will not be issued additional credits. doctorSIM withholds the right to single-handedly cancel any requests deemed to be using credits without respecting the program's conditions, and not restore the available credits to the user's account. If you find a website with better prices within the first 24 hours of your purchase, doctorSIM will refund the difference in credits (1 credit = 1 euro). doctorSIM acts as an intermediary between a number of specialised unlocking service providers and the customer. Our goal is to offer a safe, professional unlocking service with an exceptional customer support for consumers worldwide. doctorSIM is not responsible for the methods or procedures used by unlock code suppliers. Should you have any concerns regarding this issue, please contact us for further clarification before making your request. doctorSIM is not aware of the customer’s legal obligations with his/her network provider and therefore cannot be held responsible for any contract breaches the customer may incur with his/her network provider as a result of unlocking a device.